Not all of us have the desire to learn the nuances and technical aspects of shooting stills or videos on professional grade DSLR cameras. Many people just simply want to capture a moment forever without the hassle or complications that come with learning the tricks of the trade. To be blunt, not everyone wants to be a photographer. If you’re any of those, and you don’t see the need to waste money with one-time-use cameras, the “point and shoot” camera is the best avenue to take. Nearly all completely auto, the market of point and shoot cameras or non-SLR digital cameras are designed to do the heavy lifting via computer programmed cameras. There is very little you and the user has to do to get a decent shot with a point and shoot. Often times people will use point and shoot cameras for video recording on vacations, or vlogging — as most of the cheap digital cameras (or expensive ones) available in the twenty first century are extremely light. We’ve reached out beyond the properties of professional photography and videography into the world of simple, easy to use, and fairly cheap digital cameras. Here are the ten best ones on the market right now. You would be hard pressed to find a company in photography and digital imaging technology as renown and popular as Canon. The Japanese camera and imaging company have been at the forefront of the industry since the introduction of these things to the consumer market. It has played a tied fiddle at the top with Nikon for a while now, and has a tremendous offering for all those looking to get into still or video capture, regardless of the level of intensity. That’s what the Canon PowerShot ELPH 180 does best, it’s wonderfully simple. The PowerShot line-up from Canon is the “go to” for those looking for a quality point and shoot camera without having to spend all that much. The PowerShot ELPH 180 is truly incredible with a twenty-megapixel image sensor, this camera will take stunning photos, in any atmosphere. The 20mp sensor pairs extremely well with the onboard Digic processor, and the PowerShots near standard eight times optical zoom. As you will see later in this list, plenty of online retailers can take things like the Canon PowerShot line-up and throw in a ton of extra stuff for nearly the same price as just the camera itself. The Bundle here from Imaging World comes a travel pouch (padded) for your camera, a SanDisk memory SD Card, a tiny gorilla style tripod, a card reader (an essential piece of kit) and a memory card wallet. They even offer this bundle with the classic Silver colored PowerShot ELPH 180 and the Red version which is a beautiful crimson shade. For a relatively low price point, you can have yourself one of the most powerful, one of the most simplified, one of the smallest point and shoot cameras ever made -- let alone, on the market today. Canon is a king in a throne room with two crowns, and you just can’t go wrong putting in a bit of dough to get the quality they put out to consumers. The bundle value is over a hundred dollars of goods, for half of that price (just the camera alone is listed at just over a hundred dollars). The other king in the castle, Nikon, needed an answer to Canon’s control over the simple, and small vacationers digital point and shoot camera. Which is exactly where the Coolpix line-up was bred. And to be honest, I think they won the name game. It is far cooler to take out your Coolpix camera, something that sounds modern and internet friendly than to find your PowerShot, something that sounds like a Super Mario tennis move. They look very similar, but the innards offered from the two companies are very different. Nikon has been around longer than it has even been called Nikon, via their image lens company dubbed Nikkor, which was born from business making lenses and scopes for space missions, astronomy, and weaponry. Having the Nikkor pedigree behind a camera smaller than your average smartphone, that you can just slide into your pocket is an astounding future that many folks never would have thought was possible. 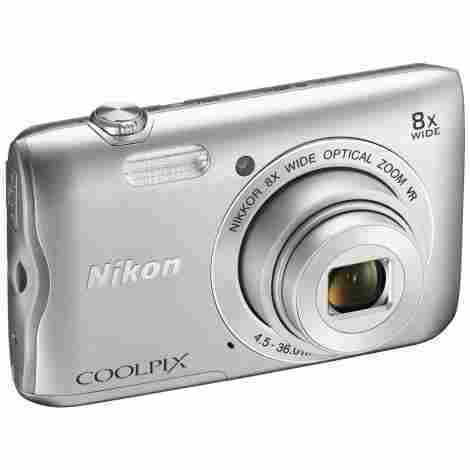 The Coolpix A300 Digital Camera is equipped with the Nikkor 8x Wide Optical Zoom lens, with an auto cover door, and extremely quick auto-focus. Nikon’s Coolpix A300 Digital Camera comes standard with a gorgeously sharp two point seven inch LCD screen (which will play your 720p video recordings very nicely for playback). There’s a standard built-in WiFi and NFC connection, and a far above average bluetooth chip for easy connection to digital printers, computers, and smartphones. It’s been bred down into the simple for taking stills or clips, but it build up in its ability to cut cables, feed your memories, and to avoid being a burden during your adventure. There’s no crust to cut around here. The Coolpix is a gold standard for pocket-sized point and shoot cameras, with a few bells and or whistles that aren't always expected from other cameras on the market. Yet, Nikon’s listing for the wondrous example of all you’ll ever need is on at or slightly below the one hundred dollar mark, which is a perfectly average price, for an above average solution to your needs. Kodak hasn’t seen the most kindness over the passing of time. What was once the most recognized name in consumer-level photography, the brand now lives near the top end of obscurity, while still making affordable, and spectacular cameras at every intensity level. I began my photography career on a Kodak when I was young, but the modern world sees little place for them in comparison to the heavyweights of today. 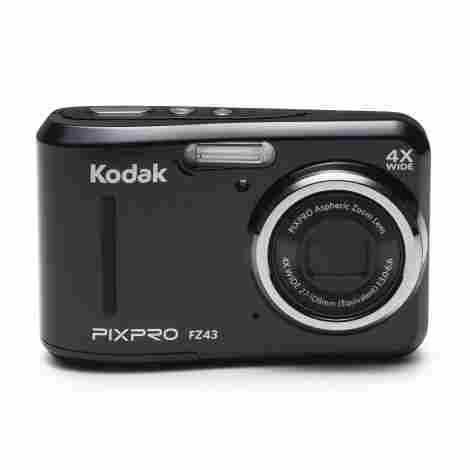 Kodak has truly struck a chord down the middle of the road margins for the market with their PixPro FZ43 camera. What some might consider a combatant in the Coolpix vs PowerShot vs *insert Sony’s over complication series of numbers here* war, the PixPro kind of floats below them, in reality. With a sixteen megapixel sensor strapped to a four times optical and six times digital zoom, the PixPro is a very sturdy standard for point and shoot digital photography. Match those decent innards with Kodak’s decades of proven build quality, and you’ve got a very great camera. No, I didn’t spell the great Californian city name wrong. I tried to make a joke out of a common misspelling, and tie it into the next feature talking point. But now, as I have felt the need to explain it, I realize that perhaps it wasn’t a great joke to begin with. Especially if you consider I now have to stare at that squiggly red line telling me I spelt it wrong for the rest of my days. The Kodak PixPro is one of the only pocket sized digital cameras to offer a wide angle lens standard. The 27mm Wide Angle from Kodak is built-in, and helps you capture far more than other lenses on other cameras will. When we mentioned that Kodak is slightly below the big names we meant it, and it seems even they are aware of the pecking order today. Which is why their point and shoot camera comes with a slightly below-premium price. Listed at just over eighty bucks, you get a whole lot of awesome camera to help you freeze your memories in time. So you want to stare at your own face, and you expect that you’ve got enough to say that is both refreshing and meaningful that you need a vlogging camera. Well, this camera was designed specifically for that reason. You may not have heard of the brand Sunlea before, but you might want to freshen up, because this company is trying to make your recording days a heck of a lot easier with their “flashy but budget” camcorders and vlogging cameras. The biggest part of finding a device for vlogging is the vanity filled necessity to be able to see yourself while the front of the recording device is pointed at you. This is important for framing, and attachment. But a lot of expensive cameras and DSLRs have fixed in-body screens (while only a few have “flappy” screens). The screen on the Sunlea Vlogging camera was built with one thing in mind, flipping up and showing the author of the vlog what they look like on camera. It’s a three inch, full frame display that can rotate a complete one hundred and eighty degrees. For a relatively unheard of -- okay, they’re pretty much completely unheard of -- company to come out swinging with a “premium budget” camera for vlogging is ludacris. But they did. And what they brought with them is rather impressive at this price point. 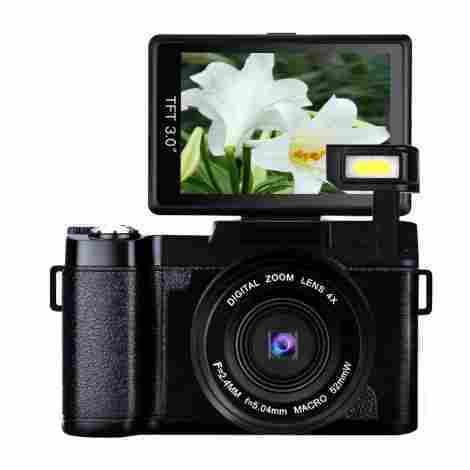 The Vlogging Digital Camera from Sunlea boasts a twenty-four megapixel camera sensor, with the ability to record video in sharp 1080p resolution (though the frame rate isn’t documented anywhere we could see). That’s a whole lot of camera to come flying in from left field. The Vlogging Digital Camera from Sunlea is about the same price as the Canon PowerShot ELPH models, and Nikon’s A300 (both listed above), but it does far more than those little compact cameras. The adjustable screen, and 1080p video help make this an absolute dream option for those looking to do what it was intended for. Never heard of AbergBest? That’s okay! Neither had we, until we put together this list. There are not a lot of reasons to pick the budget options when it comes to purchasing technology. But let’s say you’re about to head on a vacation, or a backpacking trip and you’re not that keen on hauling around a professional grade DSLR, nor are you desiring to spend hours editing. Then, let’s pretend that you’ve got a strong discomfort surrounding damaging an expensive camera on a trip, or being robbed. Well if you spend less than fifty bucks on what’s essentially the modern equivalent of a throwaway single-use analog camera, going the budget route might ease your mind of all those worries. 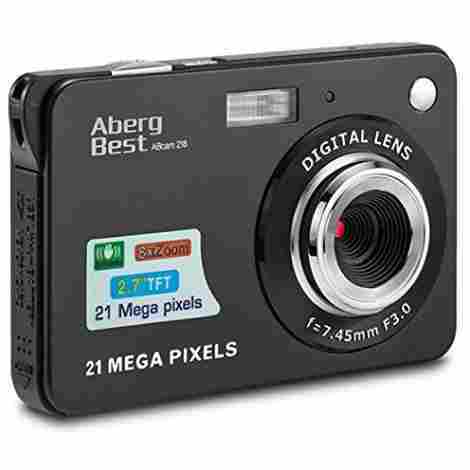 Aberg Best’s internal and mechanical components here aren't anything to write home about -- but if you are overseas on vacation or work, you should write home anyways, parents love that stuff -- but that doesn't make this any less of a great camera choice. The twenty one megapixel sensor paired with its eight times optical zoom are both great standards. But when you take into consideration that all of those things are packed into a camera about the same size as your debit card, they become amazing. Nothing says headache free ease of use quite like the proposition of having a camera smaller than your phone. The Aberg Best ABcam 218 is a fraction of the size of any other decent camera on the market. It’s so small you might not even remember that you have it on you -- though you should try to remember it’s there, because the whole reason you brought it along with you was to use it. The exact listed dimensions for the technological marvel are 3.7 inches by 2.4 inches by 0.9 inches. It’s not even an inch thick! It’s usually considered budget if the product isn't made very well, and is of a completely replaceable price range. The ABcam218 from Aberg Best is one of those things, and it’s not the poorly made part. For the price of feeding four at your local McDonald's, you can capture the memories of your trip, of your life, of your world. All with glorious detail thanks to that abnormally high (at this price point) megapixel count. A new challenger has entered the fight! It’s pretty common for most people to forget that Sony has a very fast horse in this (and the professional DSLR) race -- I even forgot about them when it came time to begin putting this list together. The Sony DSCW830 (okay, so they’re not going to win any awards for their naming convention) is a PowerShot and Coolpix combatant, and the popular electronics manufacturer isn’t holding anything back when it comes to the point and shoot offerings here. Featuring a blazingly fast shutter and a twenty point one megapixel camera sensor, the DSCW830 is a fantastic, and lightning quick pocket digital camera. The clarity of the photos you take will be beautiful, and only ever outdone by the speed at which you can take them. The onboard software comes with nifty pre-rendered picture effects (or filters, as the kids would call them), and has a delightfully easy to use panorama shooting mode. The standards of this line-up of point and shoots is far above what is expected here. Not one to be outdone in the category of looks, Sony has obviously put a lot of time and effort into designing the look of this small digital camera, probably more so than they did on the internal components. 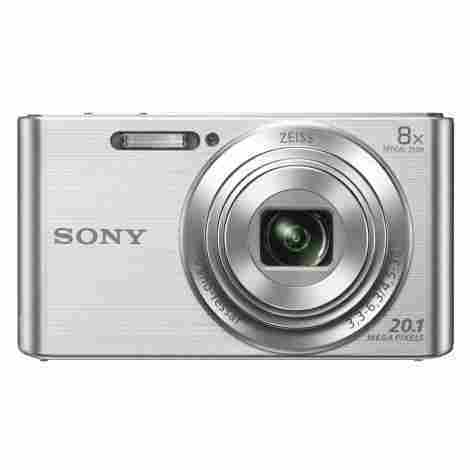 The DSCW830 from Sony is inarguably the sleekest and coolest looking rectangular point and shoot. With a brushed metal finish over a silver hue, the DSCW830 is as much an Aston Martin in your pocket as your Rolex might be on your wrist. It’s a darn gorgeous body. Only number six on our list and we've already got a very firm idea of what the average cost for a premium and paired down point and shoot digital camera should cost you. The Sony DSCW830 hovers around a similar price point as its main competition from Canon and Nikon. There’s a ton packed into this tiny, but stunning camera. It does lack some of the more finer improvements that technology has made, what with no wireless communication on-board, but that shouldn't disqualify the prettiest camera on the market from your options. Throw a filter on it! Yup, our top ten list consists of two different cameras from the same manufacturer, and from the same series. However, the PowerShot SX540 is a bit of a juggernaut in terms of comparison to other point and shoot cameras. Resembling a shrunken version of Canon’s line-up of premium DSLR cameras, the PowerShot SX540 doesn’t look like a normal point and shoot, and it shouldn’t, because here you’ve got the closest thing to that line that separates amatuer or ease-of-use photography, and professional grade. When you look at the standard kit of a camera, you’re going to be searching for sensor density, zooms, and general common technological advancements in imaging hardware. With the Canon PowerShot SX540 you have a twenty point three megapixel CMOS sensor -- the same sensor that is in some of their flagship DSLR camera bodies -- with a wonderfully excessive fifty times zoom attached to the front of it. There’s a built-in, and very crisp Digic six image processor that will turn out beautiful images from wherever it is you take it. This is (by far) the closest thing to professional photography you can get, while still holding onto the ease of use needs of the non-SLR digital cameras. 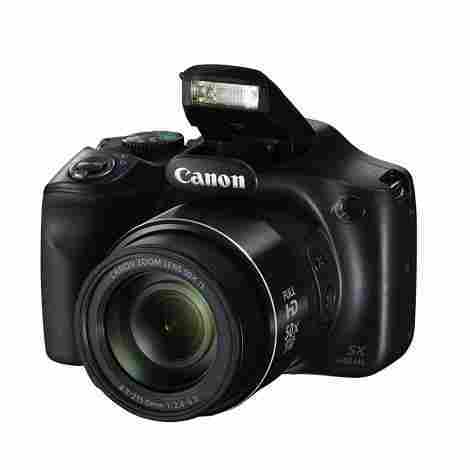 Extras are nice, and while they shouldn't be a main focus when shopping for your new digital camera, there are some quality of life improvements when it comes to the flash of the Canon PowerShot SX540 digital camera. If you consider that the goal is simplified photography or video, these could be crucial. The SX540 boasts a blazingly fast built-in WiFi and NFC data connections, allowing you to send or receive image or video data wirelessly to printers, computers, or your mobile device. On top of that, you get some impressively simplistic software designs like the Story Highlights feature that compiles images and videos from specific events, locations, or recognizable faces into groups for simpler story telling. The Canon PowerShot SX540 isn't going to sway you if your looking for a solid budget point and shoot, but you will thank yourself for the splurge when you sit back and enjoy some of the best photographs and videos that this level of imaging technology can offer. All at a third of the price of the cheapest introductory professional DSLR. Move over Fujifilm, we’ve got a big boy putting on their hipster costume and storming your mead tasting event! Canon has really done … a thing with their PowerShot offshoot line the “G” series. This, the G9 is a wonderfully adorable attempt at being as cool as they can be, without adopting the name (and the pending lawsuit) of the Nikon “Cool”pix line-up. At this point, Canon can do whatever they want with the outside of their cameras as long as the insides remain on the cutting edge of imaging technology. Oh man. Where does one start? How about the Quinoa-burp-inducing faux-leather accents? The silver body (if you opt for the silver version) is wonderfully juxtaposed with the brown fake leather accents for that extremely sleek but still retro look. 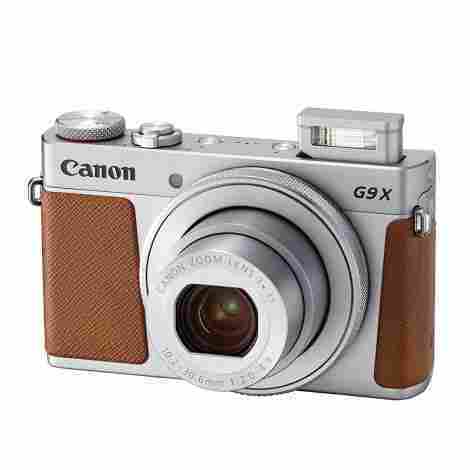 Canon offers a wide variety of accessories to boost your hipster status with their G9 and the rest of the line-up. Faux-leather carrying cases, camera straps, you name it. There’s is something to be said for putting that much time into the stylings of such a small digital camera. The Canon PowerShot G9 X Mark II is absolutely dripping in features, so we had to throw them all into one section. It comes equipped with a 20.1-megapixel camera sensor. It has a Digic 7 image processor with subject tracking auto-focus. It has wireless communications via WiFi, NFC, and Bluetooth. A wonderful preserving three times optical zoom. A three-inch touch panel LCD display screen (though it loses points for not being on a swivel), and it has one of the fastest shutter speeds of any digital camera on the market with a staggering 8.4 frames per second shooting capacity. The Canon Hipster Dumpster -- errrr … I mean PowerShot G9 X Mark II -- is a premium version of an already premium line-up of point and shoot digital cameras. The price average reflects that. But don’t let that fool you. There is more packed into this tiny, adorable vegetarian package than most professional DSLRs have. This is an astounding camera, at any price, if you’re searching for the easy to use capturing of time. Leave it to an electronic company like Panasonic -- a brand that has been great over the last few decades, but hasn’t lead in any market -- to revolutionize, and popularize the “Lifeproof” digital camera for consumers. 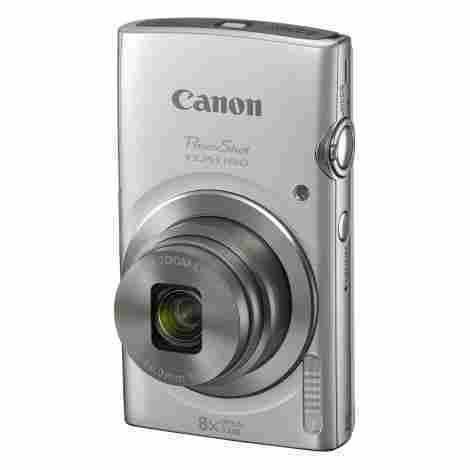 This futuristic looking point and shoot camera is the hybrid of everything GoPro, and everything Canon PowerShot. It’s the world’s best in world traveller cameras. We tend to baby our electronics. To no real fault of our own. The market has inflated exponentially over the last few years and refuses to slow down, which means we pay more for the best, and we can’t really afford to replace them easily. So we baby them. The Lumix line from Panasonic aims to dissolve that fear. It’s shockproof, waterproof, dust-proof, and comes with a bag of accessories that will stop it from sinking, clean it up, and keep it attached to your hip at all times. This is the champ of rugged point and shoot photography. No competition. Up to a depth of eight meters, the Panasonix Lumix DMC-TS30A is a beautiful, and high-powered underwater camera. Take it out of the water, and you've still got a very versatile digital pocket picture taker. The sixteen-megapixel camera producing stunning shots and when paired with four times optical zoom, a bright torch flashlight, and video recording up to 720p, there isn't much you can’t trust this camera to do. 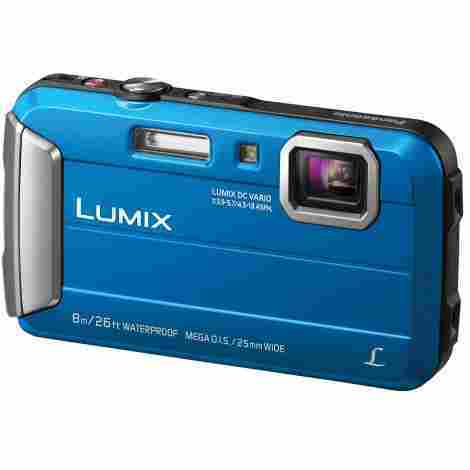 If you were to take all of the capabilities of the premium point and shoot cameras like the Canon PowerShot or Nikon Coolpix lines and made the protected from all the elements (up to a certain extent), you’d get the Lumix from Panasonic. All of which is well worth the price point you'll pay for this option. Maybe my parents we’re trusting. Or maybe they weren’t that sharp. Most likely, they just didn’t pay that much attention to what I was doing. But I can so vividly remember the first time I held a camera (analog at that time) and it just froze me. I was obsessed early, but most kids don’t get the opportunity or exposure to the beauty of still photography at that early of an age. But what if they could? GordVE is seeking to change that. That might sound like a scary thing. But designing a product from the ground up to support the young budding photographer in your life is a keen and brilliant idea. Make it mostly competitive regarding technology, and you've got a perfect gift for any child with an eye and an aspiration. Made with a rugged body, and silicon wherever it can afford it, the Creative Kids Camera is fairly shockproof. Never worry about handing your child an overly expensive and fragile piece of kit again. 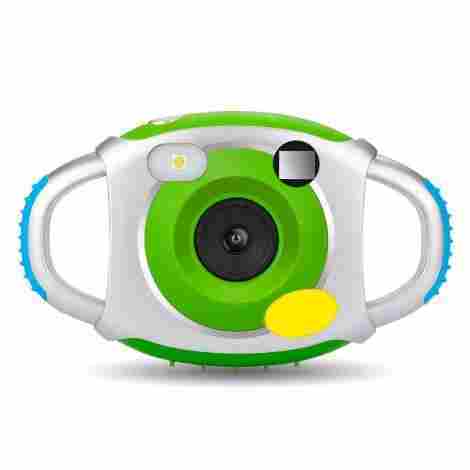 It would be far too easy for the manufacturer to put a protective case around a garbage camera and call it a day, but the Creative Camera for Kids by GordVE is surprisingly high quality. On the inside anyways. Sure, the max photo size is 5 megapixels, but that helps with the restricted square framing. What is shocking is that the Creative Kids Camera can shoot video in 1080p. There will be a whole bus load of newly seeded filmmakers coming out of the woodwork once this generation grows up. It’s very afforable. It’s child proof(ish). And it’s not yours. How much more could you be sold on this camera? Even if your child does manage to maim the gift, it’s the cheapest camera on this list (and one of the cheapest digital cameras on the entire market) so you truly can’t be all that upset if you’re force to replace it. There is a ton of value in this device, and in exposing young people to all sorts of art forms. It’s the simple life. It’s the life you’ve chosen so that more time can be spent focusing on the world in front of you, and around you, than behind a camera. The life where you can look back on a slough of memories without the painful reminder of the all the time you spent putting the photos together and editing. The automatic, auto-focusing life. It’s a good life. There isn’t always call for the exuberant, or overqualified. Sometimes you need to snap a picture of the beach, and then go hang out on the beach without a worry. We’ve traveled up and down the expected, and the extraordinary with our list here, and we hope you’ve found it …. capturing. HA! As most of the items on our list are coming from extremely reputable electronic companies, with a long-standing and historic career in manufacturing and designing, we didn’t worry about the build for most of our time plucking items. The handful of large, household names in the imaging or photography worlds are extremely reliable in nearly one hundred percent of the consumer goods they put on the market. That being said, there are a few unknown or little-known companies on this list, and with those, we really took a deep dive into how they’re made and with what are they made of. For the most part, you’re going to find a lot of hard plastics and metal in digital camera build. The bodies tend to lean towards the metal materials when considering the frames, but it’s not usually the body of the camera that fails you first when it comes to the more budget-friendly options. It’s the electronics. Unfortunately, as nearly all the consumer electronics worldwide are closed systems, built with the express intention of never having you go inside of them (very much the same thing can be said for digital cameras), it’s not often that you can tell from spec sheets or promotional material how well the innards are designed and put together. When it comes to electronics, you can usually rely on two factors: User reviews, and price. The more expensive the electronic, the better it is made (usually) and the higher quality of the parts within it. You can also trust that user reviews will be the best and first place to find out about things giving up on those poor unfortunate test consumers. While there is a very decent basic level of expectations regarding what a camera has within it, and the ability of said camera is expected. We have all come to assume that a modern digital camera will have a decent — roughly twelve to thirty — megapixel count on the imaging sensor, a semi-relevant optical or digital level zoom, a good display screen, autofocus, yada yada. The only true variety at similar price points is going to be in the flair. The juice of the squeeze. For instance, is the camera waterproof? Is it dust-proof? Shockproof? Does your digital camera have the ability to connect wirelessly to other devices via WiFi, or NFC signals? Will it connect to mobile devices, printers, and computers via Bluetooth? Examples of the extra additions to cameras are plentiful, and we’re not going to bore you and go through them all there. But it was key to keep in mind a variety of bonus features when comparing a lot of cameras that hovered around the same price points. And you should too while you shop for the best one to suit your needs. As with every market, there’s a median price for a generally everything. And every single different field and type of photography gear is no exception. Obviously, there will be a gap between amateur, or easy-to-use imaging electronics and the big and bulky expensive professional grade DSLR equipment. But that doesn’t mean that everything in the point and shoot variety is going to be cheap. Long gone are the days of disposable vacation cameras (and thank god, because those old Kodak analog point and shoots were as much of a waste of plastic as they were terrible at taking photographs). There is a premium end, and a budget end, both of which we always try to include when doing lists like this one. But it’s truly the middle where the average consumer will find themselves, swimming in as many options as they can possibly recommend. If you’re looking for a solid digital camera that is equal parts easy to use, small and compact, quality electronics, and able to stand the test of time (for a while anyways), then you’re going to be looking around the median that we discovered. Which is the one hundred dollar mark. 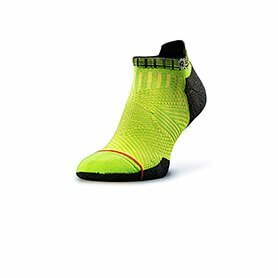 A little above, or a little below that price and you’ll notice a lot of amazing options that hover there. Q: What is a good Megapixel count? A: There is no real answer to that. Megapixels matter, sure. But they aren’t the whole picture. They aren’t the hook to hang your hat on. There are a lot of other factors that go into creating a crisp and clear vibrant photograph, the megapixel count on a camera’s sensor is only one part of that. It has, however, become a consumer-facing bragging point that has lead to the misunderstanding and misjudgment on how important that single number is. If you’re looking for premium quality end products, stay above twelve megapixels, and if you’re not going to do any post-processing on your images, stay before thirty (though not much on the market for digital point and shoots reach that high, if any). Q: Will it withstand rain? A: Most of these cameras will not. Most of anything with electronic parts will not. Unless your camera, or your gear expressly invite you with enticing words like “weatherproof” or “waterproof” don’t get them wet. That’s bad for electronic things. You should, however, take an umbrella with you if you plan on shooting some photos, this way the rain won’t get in your way, and you can capture those awesome wet moments. Q: Can it be used for vlogging? A: One of the most frequently seen questions in the question and answer section of all of these point and shoot cameras. Because of their lightweight, and remarkably powerful innards, a lot of vloggers prefer to shoot with small digital cameras because it gets tiring holding up a large DSLR all day. But unfortunately, that’s not really the target market that most of the camera manufacturers around the world are gunning for. Especially in this classification of camera. Almost all of the products on our list have solid, immovable display screens, which makes them useless for you vloggers out there. Aside from the one (that is expressly called a vlogging camera), you’ll be hard pressed to find a decent vlogging rig on this list. Sorry YouTube! Q: What is the best brand? A: That is a very good question. A fantastic question without an answer. Is that ironic? Or just unfortunate? You could ask a convention load of professional, amateur, or ignorant photographers which of the major brands is the best, and you’re not going to walk out of there with a definitive answer. Some people are Canon fans, while some are Nikon. There are those that prefer Fujifilm, or Minolta. There are folks that want a Sony. The market (technology wise) is not that wide at the top of the mountain. Everyone is making strides in the tech, but they’re all doing it side-by-side. If a clear forerunner emerges one day, it may even be detrimental to the future of the market. Healthy, and relatively evenly matched competition among giants is what propels technology innovation forward at such a blistering pace.